Sir Richard Burton is best known as an explorer and translator of Arabian and Indian books, many of them sexually explicit. He led a life well beyond the pale of the typical Victorian. Richard Burton was a very famous actor with a brilliant voice. He married Elizabeth Taylor twice and led a life which was often as dramatic as the characters that he played. Howard Marks became famous as a cannabis smuggler. He used the alias “Mr Nice” and adopted this as the title of a book that describes his exploits. Each of these men has a roguish streak to their character, but they also have a number of other things in common – one of which is that they each began their adult life at Oxford University. In fact they attended three colleges which stand, cheek by jowl on Oxford’s Broad Street: Exeter, Balliol and Trinity. Each man was a master of disguise, though for rather different ends. 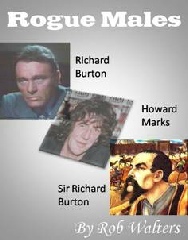 Each was a great traveller: Howard for the drug trafficking, Richard for the film sets and Sir Richard for exploration and consular duties. They were all writers. Two of them were Welsh, two shared a name, two are dead, and all three are famous in their different ways. Finally they were all iconoclasts, mould breakers in different times and in different worlds. This book illuminates the fascinating lives of each of these interesting men, but also speculates on how they might react to each other. It recreates the Oxford that bred them, traces their subsequent lives, and then leads them back to the city so that they can meet, discuss and converse. Two of them seize the opportunity to avenge posthumous wrongs. The discussions are compelling and wide ranging; they include a spirited debate on the society envisaged by Howard Marks and his implied by lifestyle together with the reactions of the Victorian explorer and much married actor to that society. In providing a multiple biography the book test the veracity of the genre itself. Meanwhile it takes biography one a stage further, moving smoothly from well-researched fact into fiction whilst carrying the character of each of the men along the way. In doing so it airs some of today’s controversial topics, for example: American hegemony, the freedom to consume drugs, the role of feminism, the value of education. These are exposed to the soaring intellectuality and conservatism of the older Burton, the articulation of the younger Burton and the liberality of Marks. The results are sometimes shocking, always interesting, and often edifying.